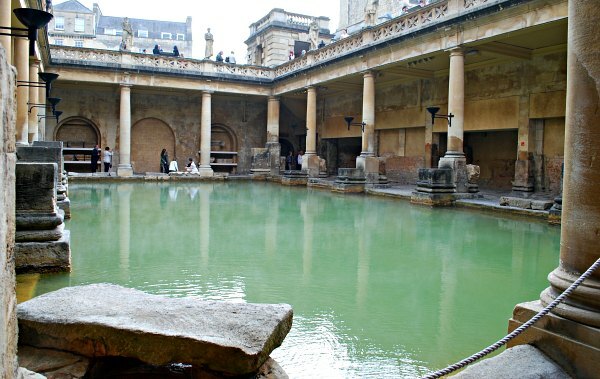 The Roman Baths – They’re Bath’s top tourist attraction for good reason. If you want a fascinating insight into how the Romans lived in Britain, this is it! Inside you’ll see the main bathing pools, all the hot rooms and learn how the site developed but was covered over again by the streets of Bath. The Roman Baths are in the courtyard next to Bath Abbey. Thermae Bath Spa – Since you can no longer bathe at the Roman Baths, this is the modern way to enjoy the hot springs of the city. It’s a modern spa-style attraction with an amazing roof top pool, large indoor pool, sauna rooms and treatment rooms. What you get here is a luxury experience with prices to match, but we loved it! 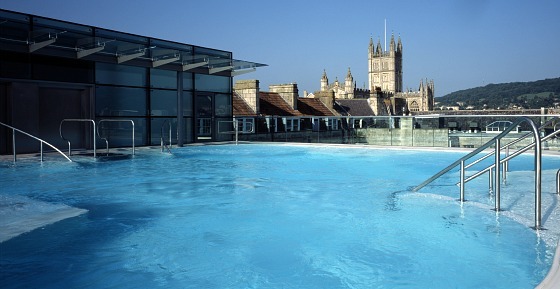 And remember, as you’re gazing at the modern city of Bath from the pool on the roof, that in essence you’re doing exactly what the Romans used to do. 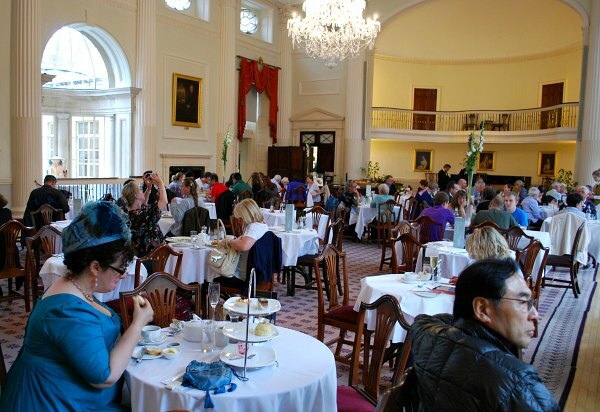 Assembly Rooms – Back in Jane Austen’s time, these rooms were the social centre of Bath. It’s here that privileged people came to dance and meet other well-off Georgians. The rooms have been elegantly maintained, so when you step inside, you still feel like you’re in the 1700s. Each room has a different style and colour theme, but they’re only available if there’s not a private function taking place. While you’re here, there’s a Fashion Museum located downstairs that you may wish to visit too (details below). 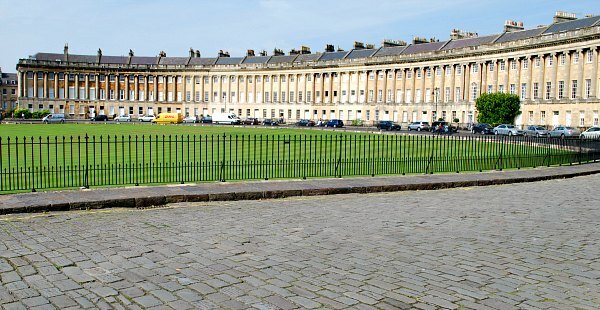 The Royal Crescent – There are 30 houses in this street and they were built as the most exclusive addresses in Georgian Bath in an attractive crescent shape. Today, many of the houses have been turned into apartments and one is a luxury hotel, but we’d recommend a visit to the museum at Number 1. This house has been restored and laid out as it would have been in the late 1700s when a ‘gentleman’ called Henry Sandford lived here. Although there’s a charge for the museum, it’s free to visit the street and there’s a nice park area in front of the Crescent to enhance the view too. The Circus – This circular collection of large houses is built around a grassy central area which uses trees to stop those who bought the houses being able to see directly into others. 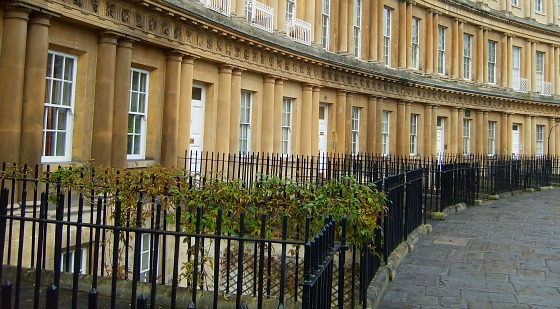 It’s another example of the fine Georgian architecture of in this part of Bath but unlike the Crescent, none of the houses in this street are open to the public. The Circus is still well worth seeing though and there is a quaint Georgian Garden that has been restored and is free to visit at the rear of No 4. 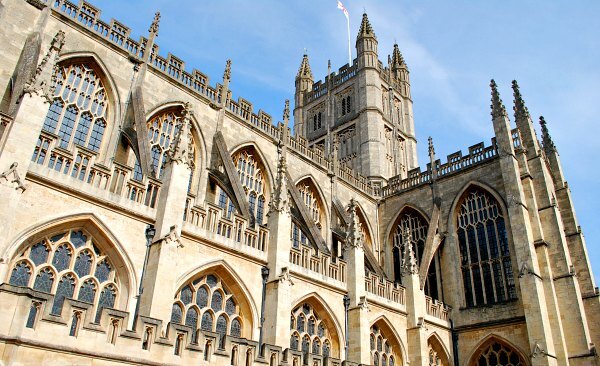 Bath Abbey – The peaks of this beautiful church, which stands overlooking the Roman Baths, dominate the centre of the city. It was founded in 1499 and when you head inside, you’ll see it has nicely balanced the history of the place with the needs of a modern congregation. Don’t forget to look up, because the ceiling and huge windows are stunning. If you want to go further up, you can also take a ‘Tower Tour’ to see the roof tops of Bath. Outside, spend a bit of time in the attractive paved area which is often busy with shoppers, tourists and street performers. Here you can also see the impressive carved oak doors of the Abbey. 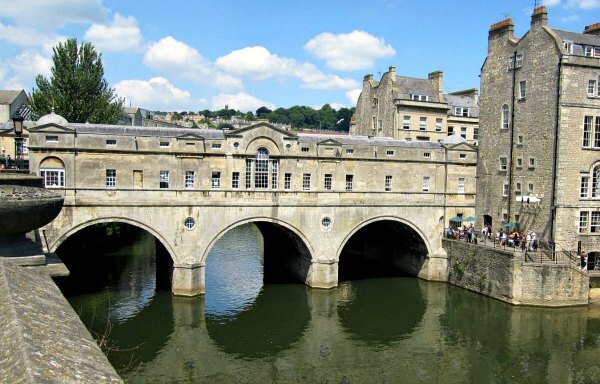 Pulteney Bridge – Bath is home to one of the most recognisable bridges in the world. Pultney Bridge is often likened to the Ponte Vecchio in Florence as both are lined with shops on each side and you don’t immediately realise that you’re on a bridge. The shops here are quaint and boutique-style, but when you look inside, you’ll just how tiny they are. You can get a great view of the bridge from the riverside walk, from the road behind Bath Abbey or from the Parade Gardens. The Pump Room – This room is part of the Roman Baths complex and back in Georgian times it was another important social hub. In those days, the upper classes came to ‘take’ the hot spa water which comes from a fountain which overlooks one of the baths. The Pump Room is mainly a fancy restaurant and café where you can dine in the magnificent surroundings…at a price. If you just want to see the room, you can walk through it for free. If you want to dine, it’s best to make a reservation as it gets very busy. 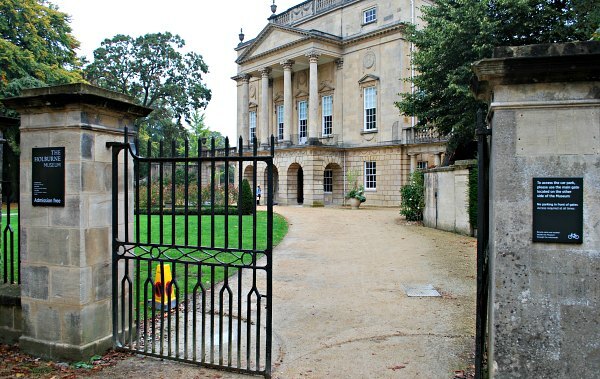 The Holburne Museum – When Sir William Holburne died in 1874, he left his collection of art, sculptures, silverware and curious items to the city of Bath. His items are on display for free at the Holburne Museum. The collection has actually grown since his death with more than 2000 extra exhibits added. We really liked the building, which is a former hotel, and there’s a great cafe which overlooks the rear garden too. 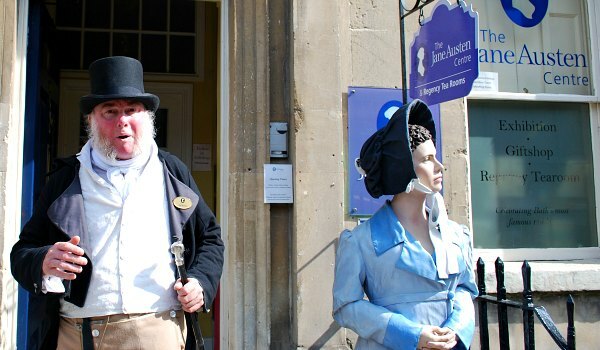 The Jane Austen Centre – This museum explores Jane Austen’s connections to Bath and tells the story of her life. She did visit the city regularly and even lived here for a short while. Ironically, she never seemed to love the place like many other Georgians did though. After a personal introduction to the centre from one of Jane Austen’s characters, you’ll get to see original letters and other memorabilia along with a dressing up area and a new waxwork of how it’s believed Jane Austen actually looked. 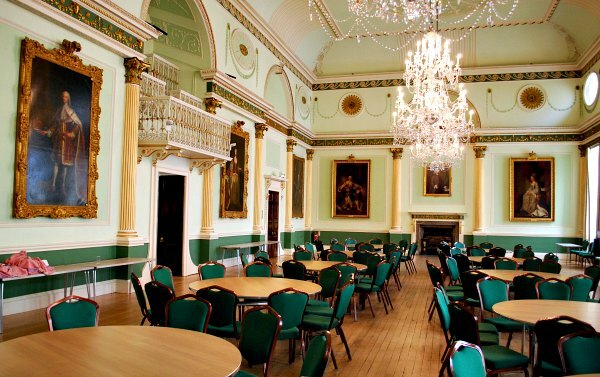 Bath Guildhall – This complex was built as a one-stop civic centre for the city and includes everything from a magnificent banqueting hall and ballroom to a lovely traditional undercover market. 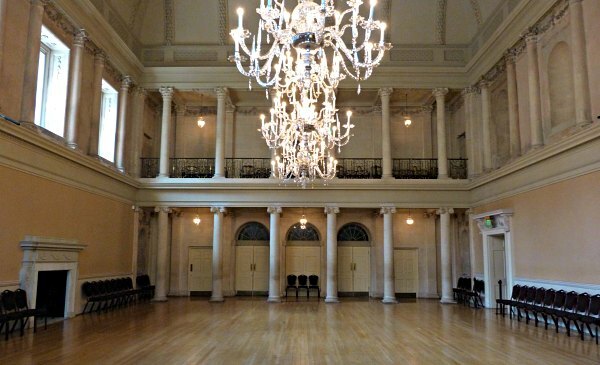 The ballroom was another one of the social centres of Bath in its day and it’s free to visit. Just ask the receptionist before you head up the stairs as it is sometimes used for private functions. Fashion Museum – This museum to fashion, which is located at the Bath Assembly Rooms, houses a large collection of period dresses, gentleman’s outfits and contemporary clothing. The collection includes dresses worn by Diana, Princess of Wales on significant occasions and Jerry Hall’s memorable red dress. We particularly liked the area dedicated to the ‘Dress of the Year’, the room which resembles the museum’s stores and the dressing up area which features replica Victorian clothes. 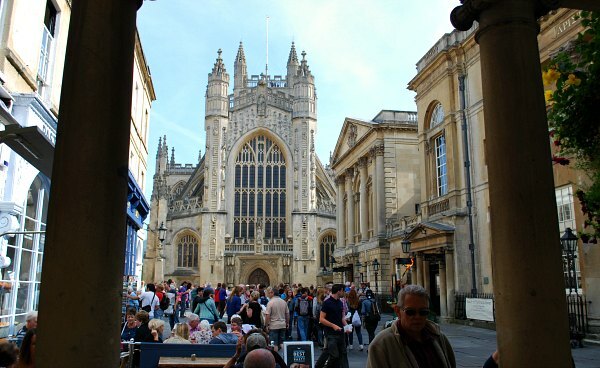 Free Walking Tours – Bath is one of the few historic cities in the world to offer free guided walking tours. You meet your guide by the sign board outside the Roman Baths in Abbey Church Courtyard, where the tour times are listed. They will then lead you on a 2 hour walk around the significant areas of the city. The tours are organised by the tourist office and our guide was very knowledgeable. On the tour, we called in at the Abbey, walked round the Circus, visited the Assembly Rooms and saw many other historic buildings and sights. 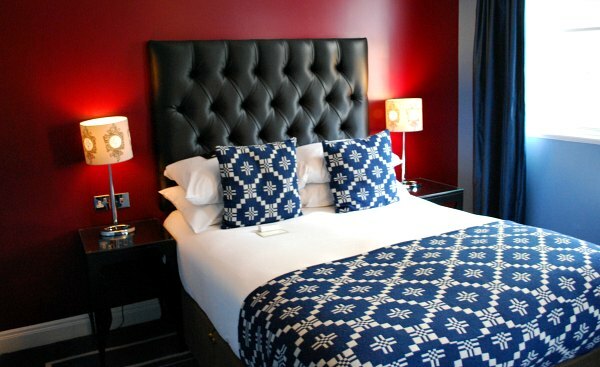 We stayed at the 4* Francis Hotel in Bath which is in a great central location on Queen Square. We found the hotel to have luxurious rooms, superb breakfasts and a very warm welcome. The building is historic too as it’s been converted from prestigious town houses built by John Wood (the elder) and we liked the sign boards inside reflecting the notable people who’d stayed in each of the houses. If you stay at this hotel, you’ll be able to walk easily to all the significant locations in the city and it also has a small car park at the rear (additional charges apply). You can see other options for Bath with latest prices and customer reviews here. All the sights of Bath are in walking distance of the centre so getting around is easy. However, parking is very expensive! If you’re booking a hotel in the centre, make sure it comes with a parking place and if your hotel is outside the centre of Bath consider using the Park and Ride buses. If you need to hire a car, we recommend Opodo because they compare top brands for the best prices. The railway station is very close to the centre of Bath, so coming by train is a great idea. Another option for getting around is the Hop-on Hop-off Bus Tour which has two routes, one around the city centre and the other going to the wider area. We found the tours to be informative and enjoyable, especially when the weather is nice enough to sit upstairs on the open-topped buses.